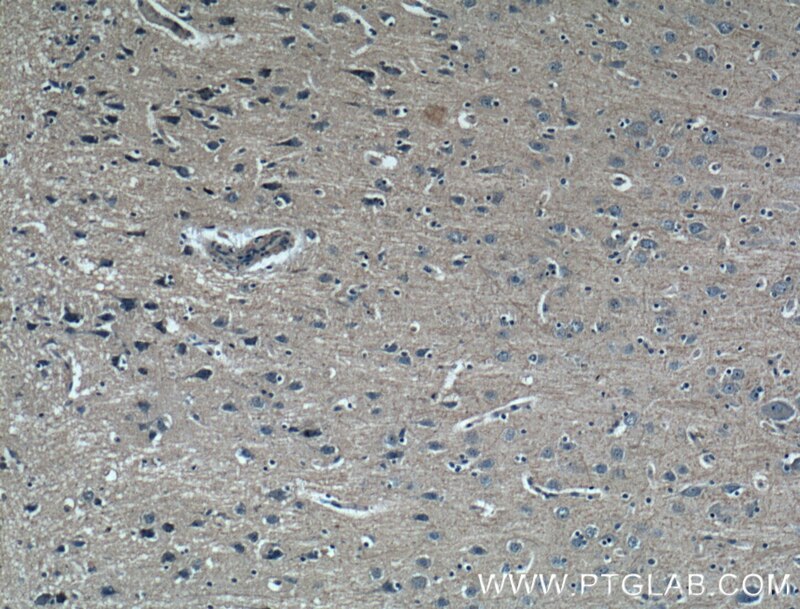 Immunohistochemical analysis of paraffin-embedded human brain tissue slide using 60062-1-Ig( GMF-beta antibody at dilution of 1:200 (under 10x lens). 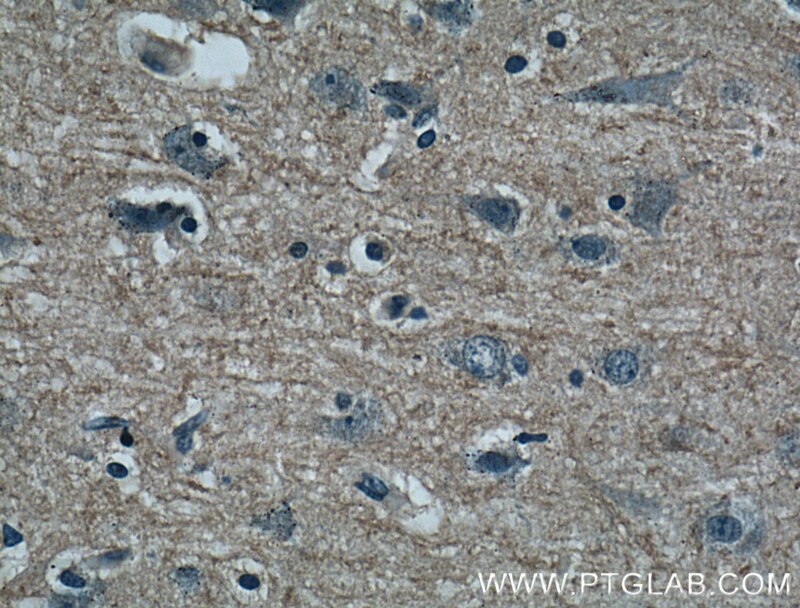 Immunohistochemical analysis of paraffin-embedded human brain tissue slide using 60062-1-Ig( GMF-beta antibody at dilution of 1:200 (under 40x lens). GMFB, Glia maturation factor beta, is a nerve growth factor implicated in nervous system development. It was reported that GMF-beta promotes the phenotypic expression of glia and neurons and inhibits the proliferation of their respective tumors in culture cells. GMF-beta protein is specific to the brain where it is expressed in glial cells (mainly astrocytes) and insome neurons. Higher levels of GMFB were found in the central nervous system, except for the spinal cord, and in thymus and colon. Dopaminergic Toxin 1-Methyl-4-Phenylpyridinium, Proteins α-Synuclein and Glia Maturation Factor Activate Mast Cells and Release Inflammatory Mediators. Co-Localization of Glia Maturation Factor with NLRP3 Inflammasome and Autophagosome Markers in Human Alzheimer's Disease Brain. Bipolar disorder in youth is associated with increased levels of vitamin D-binding protein. 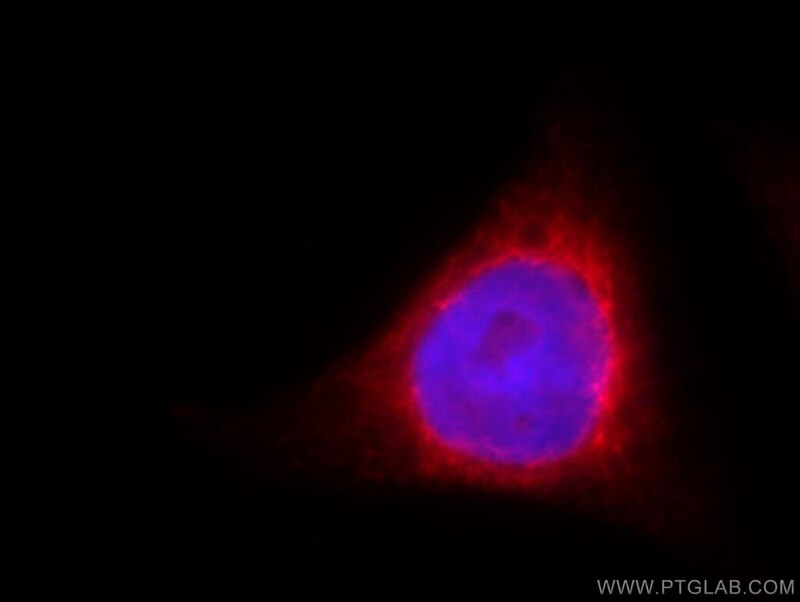 Immunofluorescent analysis of Hela cells, using GMFB antibody 60062-1-Ig at 1:25 dilution and Rhodamine-labeled goat anti-mouse IgG (red). Blue pseudocolor = DAPI (fluorescent DNA dye).